In Russian tradition, any thing/event/place crucial for survival should be protected with embroidered talismans. Protective signs for a person were placed on his/her clothes directly. To guard a certain place (e.g., a workspace of a craftsman) or a certain event (e.g., wedding) people used towel-like pieces of cloth decorated with "sacred" symbols. For villagers, these "towels" had never been exactly towels. It was strictly forbidden to use them for, say, wiping a table or drying hands. These "towels" were talismans, magic tools for "shaping a reality". Each dialect of Russian language used a specific word for such a talisman. Northern Russians said “plat”, people of Central Russia knew words “roushnik” and “shirina”, Ukrainians and Southern Russians called these talismans “ubrus”. This paragraph is about a "Stenovoi plat" - a talisman for a dwelling. As you can figure out from a name ("stenovoi" means "for a wall"), such a plat usually hanged on a wall, like a tapestry. Stenovoi could be up to 7 meters long. Embroidered designs used for Stenovoi were dedicated to pre-Christian gods. They supposed to protect a household from any trouble, both real and supernatural. Also, these symbols "attracted" spirits of wealth, health, and a good luck. Traditionally, it was enough to have only one Stenovoi plat per a household. However, these who could make more, or could afford to order these talismans from village craftswomen, had a set of Stenoovois with different designs connected to either seasons of a year or a family events. After 1880s, Stenovoi could bear not only an embroidered symbols, but also a some slogan. For instance, a Christmas's Stenovoi said "Merry Christmas", Eater's one had a message "Happy Easter", and so on. Stenovoi shown here is a replica of a Stenovoi acquired in Perm region, Yurla district. A replica is 18 inches wide and 50 inches long (plus two sets of tassels, each of 10 in long). The design applied for this Stenovoi could be also used for ritual men's shirts. Besides, it was allowed for a decoration of Christian items, mostly, for bozhatka (bo-ZHAT-kah), a curtain for a family altar with Christian icons. 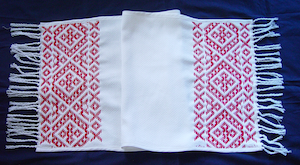 Of course, to be used for bozhatka, the pattern should be modified slightly (see below). The main pattern sits between two lines of "crosses - diamonds". In a Slavic tradition, an X-like cross symbolizes the Sun as a fertilizing power. A diamond stays for the Womb - Mother Nature's one, woman's one, Earth's one. So, the "crosses - diamonds" as a whole are a glorifying prayer to Male and Female Elements of the world (as a reward, these Elements suppose to present wearers of the pattern with blessing, a good luck, and harmony). Let's take a look to the main pattern. The central shape could be described as "a cross consisted of diamonds". This sign was extremely revered in Northern Russia. Even now, people there recognize it as "the God's Giving Hand". The central diamond represents the God itself. Other four are the God's hands, which distribute the God's blessing and energy around the world (to North, South, East, and West). It is interesting that, despite a cross-like shape, the symbol is pre-Christian. So, it is up to a design's user, what God this sign is dedicated to. The next element of the pattern is a wide red band framing the central cross. It visualizes the God's energy radiating in four directions. Please note that the band is not a pure red: it is patched with white crosses. Such a design does not connect with Christianity (Patchiness as a symbol was invented in pre-Christian times, a paragraph about Patchiness in traditional embroidery is coming soon). Briefly speaking, it is rooted in technology requirements for a nabor stitch. Mythologically, patchingess signifies that the patchy object belongs to Heaven, not to Earth. Triangle-like shapes on sides of the central symbol are lyagishechkas ("pretty frogs", delivering goddesses - Ladies of the World). It is clear that Mothers deliver "here and now", so - They bless a household with wealth, abundance and fertility in Their own way. It needs to be noticed that "pretty frogs" were not acceptable for bozhatkas. Craftswomen substituted Mothers with simple triangles while making bozhatkas. the pre-Christian trinity (Rhod and Mothers) blesses a household. 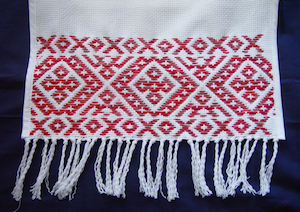 Tassels placed at ends of Stenovoi are also symbolically important. They are a token of respect for evil spirits (that's why tassels were strictly prohibited for bozhatkas). To make tassels, craftswomen should remove some woof threads - in other word, they should destroy a cloth. Destructiveness is the basic property of evil spirits, so, by damaging a cloth, people send a message to "black gods": hey, we know about you, we remember you, so do not play nasty tricks on us. E.E.Blomkvist, "Towels and Plats in Everyday Life of Russian Village"
L.M.Rusakova, "The Reflection of the World's Structure in the Embroidery of Village Women of Altay Region"
V.I.Dahl, "Dictionary of Russian Language"
B.A.Rybakov, "Origin and Semantics of Diamond-like Pattern"
V.N.Kharuzina, "Slavs: Worshipping of Fire"
N.M.Gal'kovskii, "Contradiction of Christianity and Tradition in Ancient Rus'"